I made this stew this week and I was definitely satisfied. I was excited to eat it despite that I was expecting my husband would most likely say “it’s ok” and only eat one bowl (he’s doesn’t usually go for things that have broth involved as a main ingredient). We ate a serving and he got up and went over to the stove and started scooping himself up another bowl! 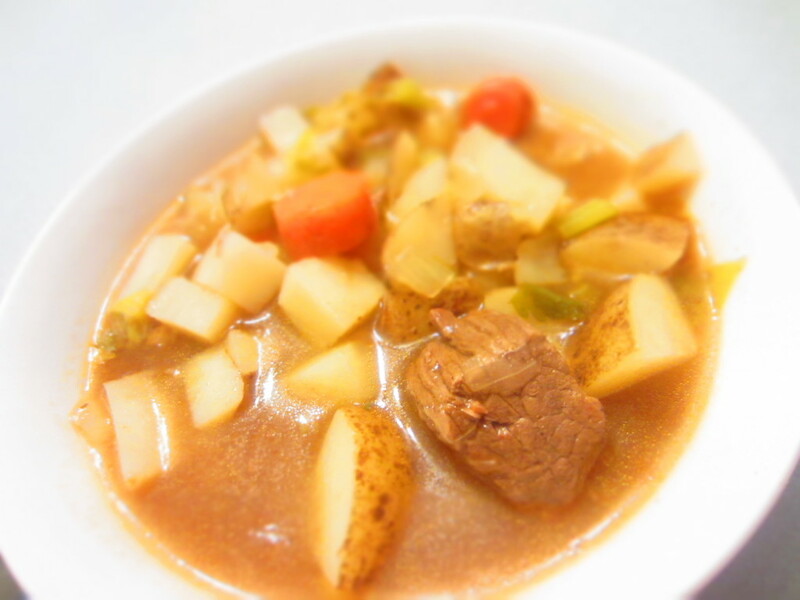 He told me something along the lines that the only other soup he’s ever gotten seconds of was my baked potato soup…so this was his way of telling me that this stew turned out AWESOME! Of course the different spices I use in this recipe definitely play a huge part in how delicious it is, but I think the key to it is to give it time in the right order. I don’t think it would taste as good if you threw it all in the crock pot at once, maybe I’ll try it sometime and let you know! To start out you let the meat, some onion and garlic, spices and beef broth simmer together for two hours. After that you add vegetables and water to cover them, then let that simmer until the veggies are tender. One thing that I think makes this so good is the onions. You put in two cups of them at the beginning and let it simmer. The onions basically dissolve and you get that flavor throughout the broth….I’m drooling, it’s so good!!! Then I add some more onions at the end so you still get your chunks of onions to eat throughout the soup, because a good soup has GOT to have onions that you can see! According to my husband and me that is, so it’s a fact. Melt butter and start browning the stew meat. Add onions and garlic when partially browned. Finish heavily browning the meat. Add the bay leaves, salt, pepper, paprika, chili powder, allspice, and beef broth. Cover and let simmer for 20 minutes. Add vegetables and water. 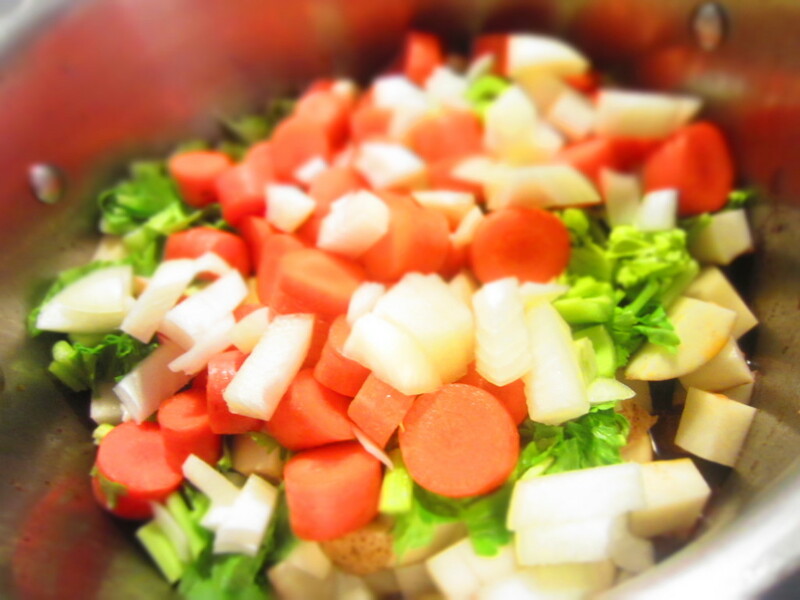 Bring to a boil and then let simmer for about 20 minutes, or until vegetables are tender. Add salt to taste (from here I usually just serve it and add any salt to individual serving if desired). p.s. don’t eat the bay leaves if you get them in your bowl.